“All of the schools will be ready for students on the 10th September and will be safe to occupy,” Minister of Public Works Lt. Col. David Burch said, as he and Minister of Education and Workforce Development Diallo Rabain held a press conference to provide information on school buildings’ maintenance. 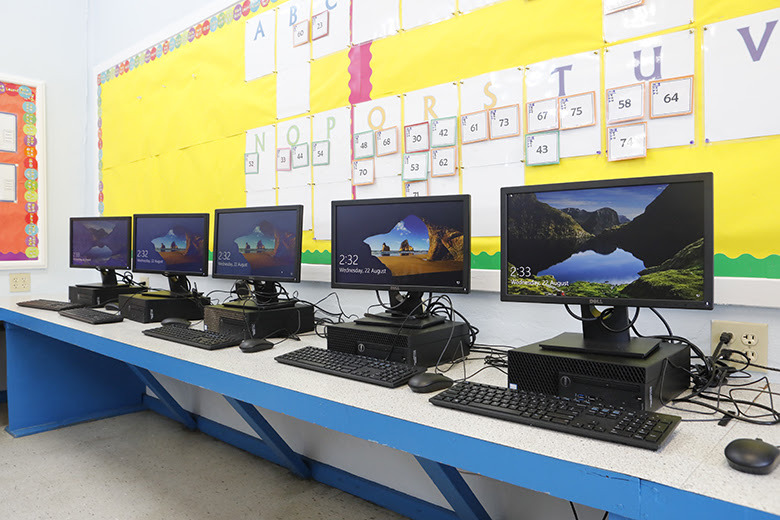 Minister Rabain said, “Having our school buildings upgraded and ready for the return of students and school staff is a priority for our Government. “Today, I will provide you with an update on the readiness of our school buildings for the 2018 – 2019 academic year which officially begins for all students on Monday, September 10th. 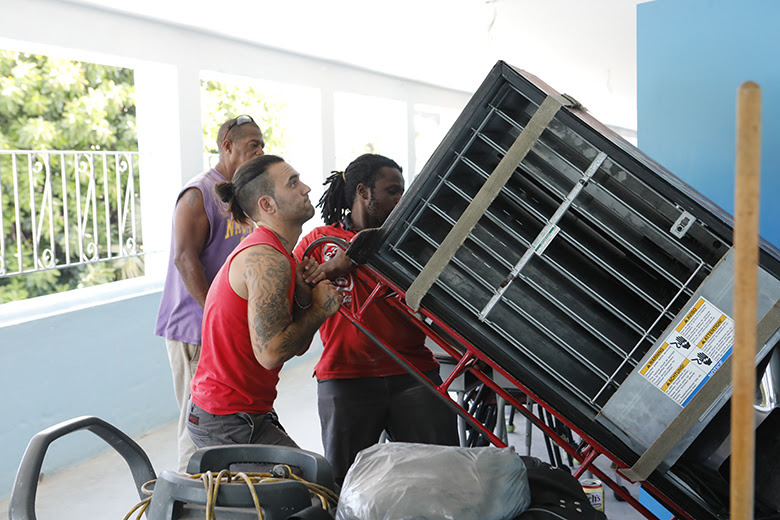 “During the summer months, Government workers in the Ministries of Education and Workforce Development and Public Works carried out scheduled maintenance and building upgrades to improve our school facilities. The main purpose of this annual maintenance program is to carry out repairs that will ensure safe and healthy environments for our students, principals, teaching, and administrative staff. 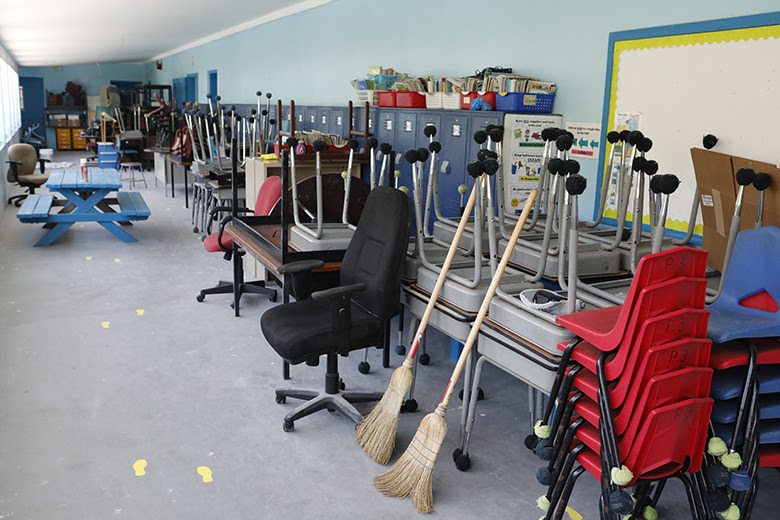 “We are in the final stage of repair work and cleaning at the majority of our public schools and I am pleased to report that we are on schedule to be fully operational and ready for our students on September 10th. Chlorination of water tanks at all schools. 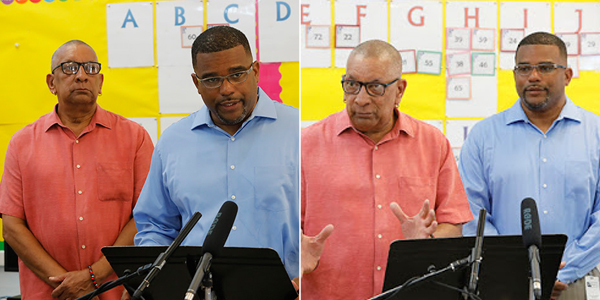 “All of our schools are expected to open on schedule, on September 10th so that our educators can fulfill our mission of providing all students with equitable access to holistic, varied and high quality instruction that is culturally relevant and empowers students to reach their full potential. Minister Burch said, “I am pleased to join my colleague the Hon. Diallo Rabain – Minister of Education & Workforce Development to report on progress over the summer in our schools. To say we are nowhere near where we were last year would be an understatement. “The Ministry of Public Works, in collaboration with the Ministry of Education facilities management team, plan out the summer school works early in the year so that when schools break for summer vacation our teams and numerous contractors can begin work immediately at the start of the summer recess. All schools have been inspected by the team and a list of tasks agreed and assigned to various work crews. “In addition to these, any issues identified by the Health and Safety Coordinator were included with those tasks. There is a limited 9 week window to complete works and all of the Public Lands and Building’s teams have been assigned to schools. It has been all hands on deck! In practical terms what this means is – all 7 work units and 102 tradesmen of the Building Section are working in schools. “The capital works were budgeted at $3 million and we will spend very close to that when all works are completed. The largest amount to date being $302,000 for the new gymnasium roof at Dellwood Middle School. Salaries, materials and supplies and small contracts are estimated to be an additional $1.5 million, some of which will be capitalized depending on the works. As always – schools are a priority for this government and funds will be moved from other projects to cover any shortfall. “This year we started the summer with 1,081 tasks and 26 capital projects but as the summer progressed and more items were identified, we are currently at 1,337 tasks and 39 capital projects. This is normal as the works progress we often uncover items that need addressing which were not previously identified. In addition, throughout the summer, right the way up to when teachers return to school, we receive requests for additional works. “Our goal is to complete as much work as we can prior to the 4th September 2018 when the teachers return to school. 30 of the capital projects will be completed prior to school starting and 9 are being deferred to other school breaks. “To date, we have 781 tasks completed and signed off in our database. Of the 556 outstanding, many are either completed and not yet signed off or are nearing completion and will soon be signed off. “We expect that when schools restart on the 10th September the completion numbers will be significantly higher. Any outstanding tasks will be tackled during the school year. “With respect to the schools condition surveys promised last year to identify required works and the viability of school buildings so the department can plan, budget and schedule those works – the surveys were tendered but there were a number of issues with the bids and concerns raised by bidders about how to price for unexpected eventualities. “We have since which decided to conduct an internal survey of a primary school as a test case to iron out the issues and based on the results changes will be made to the tender documents to better reflect what is required following which the project will be retendered. “In the interim a project is underway to utilize the newly purchased 3-d scanner to create ‘as built drawings’ for all schools as well as numbering of rooms for ease of reference for both help desk and reporting purposes. Ultimately, surveys will be carried out on other key Government buildings as well. “Additionally, another primary school will serve as the pilot project for the installation of more energy efficient LED lighting to reduce electricity costs. “All of the schools will be ready for students on the 10th September and will be safe to occupy. Great finally someone did there job. Good job guys, pat on the back. Next year lets see if we can do a little more than par and maybe have reliable transportation for these kids to actually get there. Are we supposed to applaud them? Are we now a Country that hands out medals for participating…Bermuda is becoming soft, we are too content with doing the bare minimum. Wow, all the schools will be ready for the students but will the students be able to attend schools without a bus service ? It’s amazing hoe the mold stories stopped once PLP came into power. Just shows the lies and decent people will do to get their part people back in charge. Fortunately the other parties people do not stoop that low. You can’t be serious, my bet is that you never have set foot in these schools.. But glad you feel ok with yourself feeding foolishness to whomever will eat it, I couldn’t sleep at night knowing I’ve deliberatley spoken mis-truths and made zero attempts to gather any facts, sad. You must have many sleepless nights. Then you must never sleep going off of your numerous and erroneous posts. BUT the buses won’t be there to take them to school!!! smh.. Thank you to our Government for a job well done! for what? doing their job? i will be more interested in how much it all cost, who was contracted to do what and are those invoices accounted for and how much over budget the PLP admin is already. Gee thanks for doing that guys it is way outside our expectations that a government do what they are supposed to do. Now tomorrow I want to see you again this time announcing that our busses work. Be nice if its true, time will tell. But if we cant get the kids to school on the PUBLIC transportation system. Minister needed to go 12 months ago. Only see him for photo ops. Moana Lisa’s! Wasn’t this just an update? No one asked for an award or a prize to be given for work completed. By the way, this announcement takes place each and every year prior to school openings! Go find something else to moan about!! If there is or was a problem I would expect to hear about it at this time no matter who is in government. I find it amazing that when 10′s of millions were spent on a millionares sailboat race, there was not a word about the state of public transport, now all of sudden everyone is ‘Gravely Concerned’ about it? As usual your politically motivated selective amnesia is showing. There WAS concern about public transport issues mentioned many times before the AC , and that included the buses. And the childish references to a ‘millionaire’s sailboat race’ are so very worn out . Especially when you refuse to recognize that an investment of $59 million resulted in $335 million being put into the economy. A result that your beloved PLP will never match . There were many discussions on the state of public transportation AND private contractors and licences were issued to help the public drivers with the load. The stare of PTB and their mechanics was also made public and plans put in place were hampered by the unions, to train and qualify the mechanics to work on the fleets of vehicles. The opposition at the time and the People’s Campaign also had “meetings” in which their supporters expressed concern on the issues and how they were being addressed. The concern was that the public sector had become bloated with too many not having the skills, no willing to attend the mandated training as it wasn’t in their CBA. Priority… wireless in schools? Maybe we should actually think of buying new books.. things that students (yes they are there to learn) really need!! Wiresless is very much needed in our scnools,so yes it is a priority. Books are supplied by each school as well as other necessary items.We live in a technology driven world, so ensuring that the schools have wifi is exactly what’s needed. The wireless was provided by AC35. So you’re grateful to the people behind that, I take it. Let’s hope the wireless is used for education, and not for teachers to sit there gazing at their phones. I think more the kids gazing at their phones… Businesses have enough trouble with “adults” wasting time surfing on their phones. Can you imagine what a school will be like..
Technology can be taught without Wifi… In fact MOST businesses do not use Wifi except for visitor access because of the security risks. Slush.. IF you really are a teacher, then you would know that supplies in the schools are in short supply, teachers many time have to purchase out of their own pockets. Parents are asked to supply things that the school should (Clorox wipes for example). I have seen children come home with text books held together with duct tape, and pages missing..
WIFI in schools is supposed to make students perform better? They’ll now be able to access the internet to watch negative/useless things like they can at home!